The Vogelsang Gallery of Brussels will exhibit Los Angeles artist and FSU Art BFA ’97 Melissa Herrington on December 4, 2018 on view until December 9, 2018. Herrington will make her debut during Art Basel: Miami Art Week, at Scope, with 4 new large-scale paintings. Herrington’s new abstract series “Morpheme and Half Moon Days” explores the ideas of expansiveness and continuity reduced to its purest essence. Each work functions as both an individual entity and as a part of a larger theme. Herrington explores gestural marks and subtle forms through this abstraction. 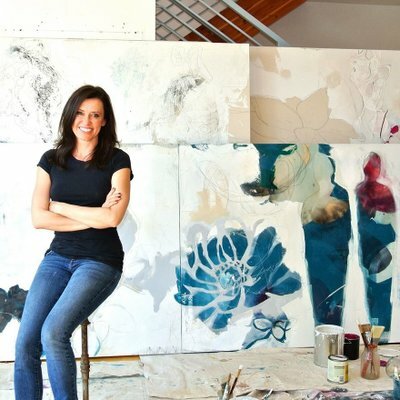 Layers are fundamental to her imagery and process; she employs underpainting, graphite lines, and subtractive techniques to infuse a work with multiple surfaces. At the heart of her artistic practice is an unmistakable relationship between distilled color and form. The 18th edition of SCOPE Miami Beach returns to Ocean Drive and 8th Street, in its bespoke pavilion, on the sand. Honored by the City of Miami Beach Mayor’s Office and Commission for its extraordinary cultural impact, SCOPE Miami Beach features 140 International Exhibitors from 25 countries and 60 cities, and welcomes 60,000 visitors over the course of 6 days. Amidst an unprecedented outpouring of critical acclaim from press, curators and collectors, and a digital and social media outreach campaign garnering over 450 million impressions, SCOPE Miami Beach is once again poised to lead the charge for the emerging contemporary art market.